A very welcoming, carefully designed home, Downham Grange is set in charming woodland grounds on the outskirts of the bustling market town of Downham Market, just eleven miles south of King’s Lynn. The home provides exceptional, specialised care for those in need of residential, nursing and dementia care and offers a peaceful and comfortable haven for all residents. Explore the services provided at Downham Grange, which are designed to make every resident’s stay a pleasant one. Don’t worry if you cannot find what you are looking for; you can contact the Downham Grange Manager, by telephone or email. Home manager will be more than happy to help you with any questions you may have regarding care for the elderly. Looking for care homes in Downham Market ? The interior of this home is of a luxury standard. All the private rooms are well appointed with en suite facilities and are stylishly decorated and furnished. Our bright and comfortable lounge/dining rooms, all of which have a kitchenette for the use of residents and their guests, are designed to support interaction, but we also have quiet areas to provide space for relaxation and some privacy. Relaxation comes naturally at Downham Grange, with the home’s very own treatment room and hairdressing salon ‘Cut and Curl’. These are used for various therapeutic treatments and offer the chance to be pampered in state-of-the-art facilities. Downham Grange has been designed to provide residents with a safe outdoor space to enjoy the warmer weather in a large purpose-built enclosed courtyard. It has attractive lawns and seating and raised flower beds for residents to tend their own plants and vegetables if they wish. Take a look at the 360o tour of Downham Grange to find out more. The interior of this home is of a luxury standard. All the private rooms are well appointed with en suite facilities and are stylishly decorated and furnished. Our bright and comfortable lounge/dining rooms, all of which have a kitchenette for the use of residents and their guests, are designed to support interaction, but we also have quiet areas to provide space for relaxation and some privacy. Many of our recreational activities take place in the lounges, helping to perpetuate the community atmosphere that is so important and of which we are proud. The aesthetics of the home are pleasing throughout, giving a homelike, peaceful and high-quality feel. Relaxation comes naturally at Downham Grange, with the home’s very own treatment room and hairdressing salon ‘Cut and Curl’. These are used for various therapeutic treatments and offer the chance to be pampered in state-of-the-art facilities. Downham Grange has been designed to provide residents with a safe outdoor space to enjoy the warmer weather in a large purpose-built enclosed courtyard. It has attractive lawns and seating and raised flowerbeds for residents to tend their own plants and vegetables if they wish. Take a look at the 360o tour of Downham Grange to find out more. Downham Grange residents can rise at a time of their choice with a variety of cold or cooked food being available for breakfast. They can have anything to eat they choose, and if preferred can even enjoy breakfast in bed. An optional programme of activities follows breakfast, and individuals have a large amount of choice in how they spend their day. They can spend time with family, who are free to come and go any time they like, relax in one of the many spacious lounges, watch TV or sit in the garden. Games and music are played daily at Downham Grange, and Tracy, our dedicated activities co-ordinator, regularly organises arts and crafts and other entertainment. Staff members are always on hand to be with residents if needed. For lunch, there is a choice of mains and desserts, and these can be eaten in one of the dining rooms or in residents’ own rooms. Most enjoy the homely communal atmosphere in the dining rooms, but are free to do as they wish. The mealtimes are flexible and can be enjoyed with family members at any time. Sometimes we take a group trip out to places of interest and/or lunch, and we have a local musician who comes in every fortnight for a singalong session. Some of our residents love helping out around the home, which helps everyone and is welcomed. You may opt to have a massage, a warming bath or one-to-one time with a member of staff, strolling around the grounds. At suppertime, there is a choice of hot or cold food, after which some residents opt to go to bed early, but others stay up until much later. Hot and cold drinks and alcohol is available, plus there is NO set bedtime, as this is your home. We can reassure you that here at Downham Grange we provide exceptional care and a true ‘home from home’ for those in need of nursing, residential or dementia care. Each one of our residents is treated as an individual and given love, attention and a unique programme of care according to their needs. The home is always open to visitors and our dedicated and professional staff are always on hand to help and advise – visitors are as welcome here as they were when the resident lived in their own house, at whatever time of the day. Each Kingsley care home is different from the others in the group. However, at each of our care homes we have a set of highly respected and award-winning features embedded within the culture, which make a big difference to the residents’ daily lives. Our daily emphasis is on the care that our residents need, whether that is physical, emotional, spiritual or mental. Residents who are experiencing memory loss benefit from arguably the most enlightened approach to dementia care that exists in the UK at present: our truly person centred approach. Our organisation, Kingsley Healthcare, recently invested into Dementia Care Matters, a world renowned consultancy group in the dementia care field, who aid us in excelling at providing quality dementia care. The person centred approach creates a positive culture and focuses on quality of life and relationships. We believe that stimulation through skilled and engaging interactions can help to diminish anxiety. We know that helping to give people a sense of purpose can create a new lease of life, helping them to thrive and to feel useful again, so we take time to work closely with family members to create care plans that facilitate this. Our approach to care is, we believe, the best available. We want all our residents to live as healthily as possible, to aid them in enjoying long and pleasant lives. We encourage regular exercise, keeping minds active and eating nutritious food. We support our residents in maintaining their independence as much as possible, and embrace and encourage ways in which that can be achieved. Our healthy, balanced meals are prepared in our kitchen using only the highest quality, locally sourced ingredients. We of course realise that eating habits vary, and our chef is able to provide a varied diet to meet everyone’s needs. The menu is regularly updated following suggestions by residents; to keep mealtimes interesting is the aim. The people, the homely environment and unique Kingsley culture all go towards creating a family feeling at Downham Grange. Staff members eat with the residents so mealtimes are communal family experiences with everyone interacting, which creates a positive atmosphere throughout the home. Our staff are trained and skilled in involving individuals in the numerous activities available, and become like family to the residents. The recently opened Downham Grange is a bespoke development located in the heart of the Norfolk town of Downham Market. The town has a railway station and good road links making the home easily accessible to all nearby towns, including King’s Lynn, Swaffham and Ely. The home is located by the attractive river - The Great Ouse. The £6 million development of Downham Grange challenges the usual perceptions of care homes by offering a high specification residence that anybody would be proud to call home. Downham Grange is bright and airy with a very friendly, warm atmosphere. The house has wide corridors, attractive carpets and soft furnishings, and some areas have stylish hardwood flooring. The 62 bedrooms are all en suite, stylishly decorated and furnished, but can be individualised to a high degree according to a resident’s personal tastes. This is positively encouraged for a more homely feel. To make life easier in the home for everyone, there are lifts, chairlifts, wheelchair. In addition, there are specialised mattresses, call bells, pressure mats and door alarms. There are several family-sized group living areas, which are highly appropriate for those residents living with a dementia. The staff work hard to meet the needs of individuals and understand the meaning of real person-centred care, but don’t just take our word for it… We actively encourage those who are considering living here to visit the home, spend some time here with us and ask any questions. So why not join us for lunch and get to know us better? The home manager will be more than happy to show you around. Visit us and experience the difference. Our skilled support team are highly experienced and have ongoing training to make sure that Downham Grange delivers only the very best quality care. They all have caring natures and their goals are to make every day a special day for all our residents. 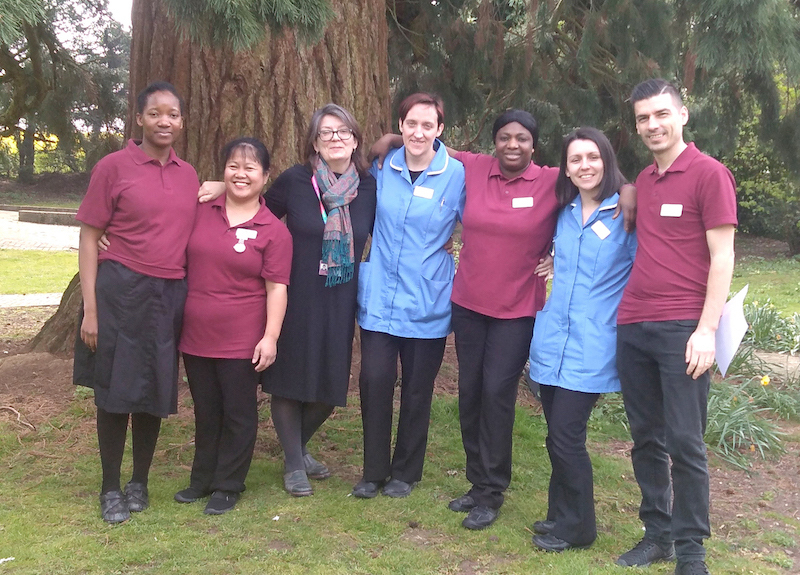 Meet our team members who are going to be taking care of you or your loved one at Downham Grange. Please don’t forget that our ‘open house’ policy means visitors are welcome at all times. We realise that the move to a care setting can be a challenging time for those moving and their relatives. Please feel free to contact the home for any information or advice, and if we cannot help you, we will try to direct you to where it is available.